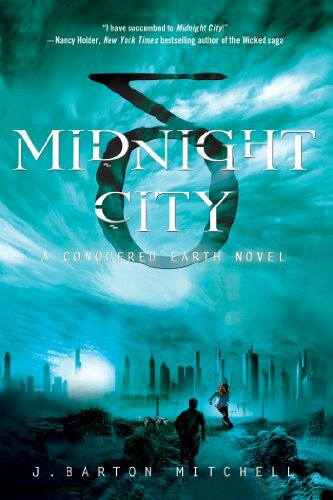 Midnight City is the first book in the Conquered Earth series, and it was excellent. I really enjoyed reading this story because of its seamless flow of action and character defining moments. They action in this story definitely took center stage, but the plot behind it was amazing. One minute Holt would be battling through a fallout swarm or a forsaken horde one minute and fighting down his soft old feelings the next. Also, the omniscient perspective of the reader allows you to really know the ins and outs of Holt, Mira, and Zoey, even when others do not. In Midnight City, Earth has been conquered by an unknown alien race that the humans call the Assembly. The first main character you meet is Holt Hawkens, a twenty year-old lone bounty hunter with one ultimate goal that dictates his every move, survival. Holt is also “heedless,” or immune to the Tone. The Tone is a signal sent out by the Assembly that slowly takes over your mind, and shows its presence by turning the human’s eyes black. By the time you are twenty, it will control you. Holt’s current bounty is on someone named Mira Toombs, a freebooter, or user of strange lands artifacts. He eventually captures her, with some difficulty, and they are both surprised by the fact that they subconsciously want to be friends, even though one is the other’s prisoner. Holt’s plan is to take her to Midnight City, a massive underground city that is one of the last remaining stationary communities on earth, to claim his bounty. However, this all changes when they come across a downed Assembly aircraft with an eight year-old girl in it who only remembers her name, Zoey. As the story continues, they realize she has special powers, and that the Assembly is after her. I really like how J. Barton Mitchell uses the Assembly. They are the obvious antagonists, and they play a huge role, but very little is revealed to the reader about them. No human has ever really seen one, they only see the machines that they all have come to fear. He only gives us two important descriptions not counting their introduction. One would give away the end, and the other is that there are a few opposing factions that are revealed throughout the story. Another thing that I really liked in Midnight City is how he didn’t just create a story, he created a full world. Not only did he fully describe locations pertinent to the plot, he described lifestyles and communities that were not of great importance to the plot, but helped give the story a complete world instead of just a setting. The most prominent of these world builders was the Strange Lands. Shrouded in mystery, it was home to artifacts with impressive powers. Freebooters, like Mira, were dedicated to discovering and creating artifacts. The addition of the Strange Lands added a whole new dimension to his post-apocalyptic world that hopefully plays a larger part in future Conquered Earth novels. J. Barton Mitchell created a masterpiece with Midnight City, hopefully there is more to come.